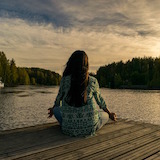 Meditation is very simple, and there is a common technique to start it with. The most important elements are getting comfortable with sitting and with your surrounding, and then focusing on your natural rhythm of breath. Sounds simple, right? It will require some time until you will be able to focus on your breath for longer periods without being distracted and having your mind wondering. Schedule 5–10 minutes each day for meditation. You don’t need much time. Mornings and evenings are best. It could be on a chair or a cushion on the floor. Take a few moments to really feel the presence of your body where you are. Feel the weight of your body as you sit on the chair or cushion. Draw a deep breath down into your stomach, then let it out like a big sigh. Pay attention to the sensations in your body. Do they feel good or bad? As you breathe in, pay attention to the sensation of breathing. Notice the way the inbreath feels in your nostrils, how the air fills your lungs as your chest and diaphragm expand. As you breathe out, your mind follows the breath, moving through your nose and dissolving into the space outside you. As you breathe in, count one in your head. As you breathe out, two. Count this way up to ten, then start again from one. Don't worry if you become distracted. Distraction is a natural part of the practice. When it happens, simply start counting from one again. Don’t control it. Let it be a natural rhythm.